Rectangles and other closed polylines are types of polygons, or closed figures with three or more sides. The AutoCAD POLygon command provides a quick way of drawing regular polygons (all sides and angles are equal). Click Polygon from the Rectangle drop-down list on the Draw panel of the Home tab, or type POL and press Enter. 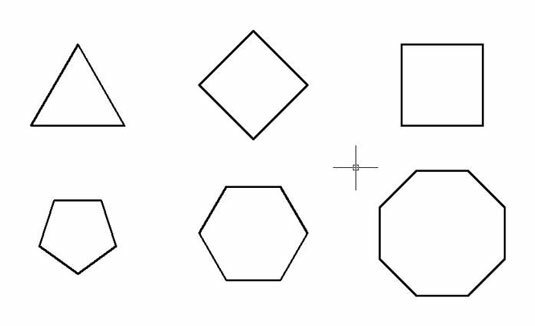 AutoCAD starts the POLygon command and prompts you to enter the number of sides for the polygon. Type the number of sides for the polygon that you want to draw and then press Enter. Your polygon can have from 3 to 1,024 sides. AutoCAD prompts you to specify the center point of the polygon. You can use the Edge option to draw a polygon by specifying the length of one side instead of the center and then the radius of an imaginary inscribed or circumscribed circle. The imaginary circle method is much more common. Specify the center point by clicking a point or typing coordinates. Type I (for inscribed) or C (for circumscribed), and press Enter. Specify the radius by typing a distance or clicking a point. If you type a distance or you click a point with Ortho Mode turned on, the polygon will align orthogonally. Rectangles and polygons aren’t special object types. They’re simply regular polylines that have been constructed by special command macros. Drawing lots of polygons in AutoCAD is a practice known as polygony.